1. The most common issue the DSmart Bot might experience a too slow load of the page. When this that happens, it might not be able to proceed its action. You will have to help it by clicking on the refresh button in your Chrome browser or using the F5 key. For example: in a case the DSmart Bot reached the address pasting stage but did not paste the address, press on the F5 key. When the page reloads, it will most likely paste the address. In rare cases you might have to refresh the page again for it to work. 2. 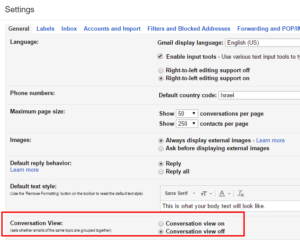 If you are opening a PayPal payment confirmation email using your Gmail account, make sure that your “Conversation View” is marked off. Otherwise your emails will stack together and the DSmart Bot will not recognize the right address. 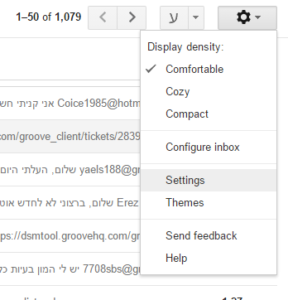 * Do not forget to click the save button below so that the changes you have made will be applied. 3. If your buyer’s address is not being copied from your Paypal payment confirmation email, make sure that your email notification settings on PayPal is set to English, otherwise the Dsmart Bot won’t be able to read them. 4. If you are not connected to DSM your DSmart Bot, it will not be able to function. Check your connection status by clicking on the DSmart Bot icon in your Chrome Extensions bar. 5. 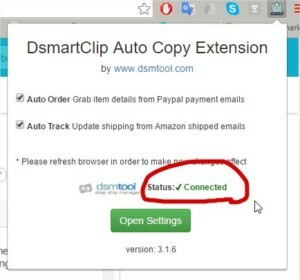 Always make sure that you are having the latest Dsmart Bot version installed on your Google Chrome browser. You can see the last version number on the DSmart Bot page at www.dsmtool.com and compare it to the one in your DSmart Bot extension. Learn how to benefit from DSM Auto paste! What is DSM Auto-paste Chrome extension?